Big White, located just 56 km (35 miles) from Kelowna, offers something for everyone. Boasting an extensive offering of accommodations ranging from basic but comfortable to lavish and luxurious, visitors are able to vacation in the manner that suits them best. Blanketed by an average of 750 cm (24.6 ft) of blissful dry powder each year, Big White has grown to become the second largest ski resort in the province. 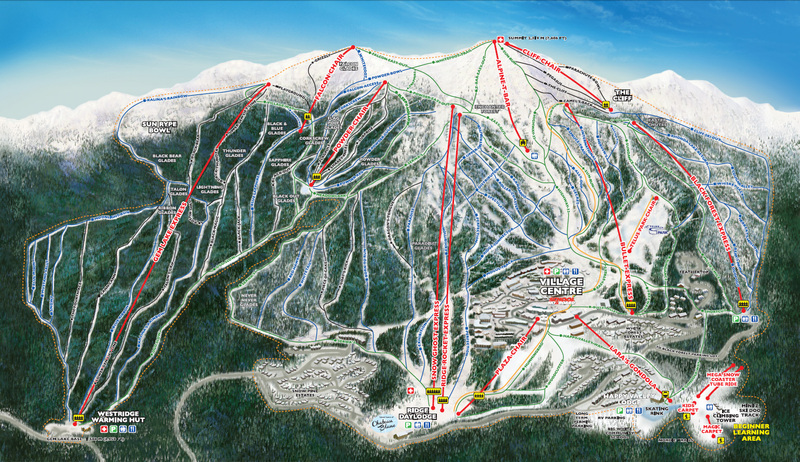 Built as a completely ski-in/out resort, Big White was designed to put its enthusiasts where they want to be. Capable of hauling an impressive 5,400 skiers up the mountain each hour, the Snow Ghost Express, a recent addition to Big White and bringing the total lifts available to 16, ensures precious moments are not wasted. Drawing visitors from around the globe, Big White entices skiers and riders alike with its stunning display of vertical terrain, open glades and deep powder bowls. With so much to experience, from the half pipe of TELUS Park to the awesome skiing and riding to be had down any of its trails, Big White delivers a surge of adrenaline. At the end of a long day, Big White comes alive with an abundance of après ski entertainment. A healthy selection of restaurants and pubs, each exuding a certain charm, tantalize taste buds with a delicious offering of food and beverage while providing the ideal backdrop for enjoying the company of family and friends. From young to young-at-heart, the addition of parades, fireworks and themed-nights provide further enhancement to any Big White stay. 56 km (35 miles) southeast of Kelowna, BC. Shuttle available from Kelowna Airport to Big White. Providing a multitude of relaxing spa treatments and esthetic services, Beyond Wrapture is a soothing escape to a well-rested and rejuvenated self. This breathtaking three mile exploration of Big White’s backcountry, lasting approximately 30 minutes, begins with an orientation and introduction to the dog sled team. After returning, Tim, the tour operator, will release the dogs from their harnesses to allow for guest interaction. An enchanting means to view the snowy landscape, this traditional horse drawn sleigh ride allows guests to cuddle up together to appreciate the alpine splendor that Big White is known for. Offering numerous programs from daycare services to instructed lessons, the Kid’s Centre promotes age-appropriate recreation in a supervised setting. With delicious dining options geared to the tastes of little ones, including spaghetti and pizza, children are made to feel right at home in their surroundings. Known as North America’s largest tube park, the Mega Snow Coaster is certain to cause uncontrollable giggles and squeals of delight from anyone speeding down its groomed lanes. With a lift to the top, children and parents can quickly re-position themselves to slide back down again… and again. Located at the base of the Happy Valley Gondola, these miniature snowmobiles allow children under 90lbs to take to the snowy hills for a rather tame version of the real deal. Tickets can be purchased from the Adventure Park Office. Enjoy a Canadian tradition with a friendly game of hockey or take a spin around the rink hand-in-hand, guests options are limitless on either of the two outdoor icy ponds. Open late into the evening, ice skating is the perfect off-the-slopes activity. This exciting adventure through the frosty forest trails surrounding Big White gives guests the option of either driving the snowmobile or enjoying the scenery as a passenger. Included in this guided tour: all necessary safety equipment and a mug of steaming hot chocolate. Offering guided tours lasting from 90 minutes to two hours, guests are led through the beautiful backwoods of Big White Resort. Numerous breaks will be taken along the way to appreciate the natural flora and fauna of the area as well as to examine the tracks of various species of wildlife. This progressive terrain park was designed so that riders could gain confidence in their ability and advance at their own pace. Complete with boxes, rails and a 400 ft. long half pipe with 12 ft. transitional walls, TELUS Park is certain to impress.